The Magician and Entertainer For Your Next Event! Humor Brings Unity. Magic Brings Awe and Surprise. Scott -- Brings It All Together and Brings the Fun To You! Searching for magicians in Milwaukee? Need an entertainer anywhere in Wisconsin? -- or even the Midwest? You're in the right place. Irrespective of where your event is happening in Wisconsin or Illinois Scott Obermann is the Magician who will suit your needs. Please click on the following link to see a list of the major cities where Magician Great Scott performs. Why Great Scott is the Best Choice for a Magician in Milwaukee -- or Wisconsin, -- or the Midwest! Will travel throughout the Midwest (Iowa, Minnesota, Michigan, Indiana, Wisconsin, South Dakota). Great Scott is one of the magicians in Milwaukee and performs magic shows in Wisconsin and magic shows in Illinois using his name Scott Obermann. So if you are looking for a magic show in Milwaukee -- think Great Scott magic. Scott has experience performing hundreds of shows and entertaining thousands of people each year. He travels to your destination and presents the show that your group needs to experience. Lots of comedy and fun while entertaining, motivating and encouraging those present. He creates whole programs for different age groups or venues. That's how he keeps children laughing heartily at one performance and then has the same effect on a group of adults that evening. Versatility is the key to entertainment. Scott's wonderful closeup sleight-of-hand magic will wow anyone. These magical talents have entertained clients at some of the biggest companies in Wisconsin. Magic in your hands and under your nose. Amazing stuff! Family audiences love Scott for his clean humor. His motto -- "Always Family Friendly, Always Good Clean Fun!" isn't just a series of words. Its what he does. Your company event will be as funny and squeeky-clean for the audience of adults as his birthday party will be for the kids. All audiences love Great Scott. Imagine both you and your guests laughing and enjoying wonderful entertainment one moment and being stunned into silence a moment later by an amazing feat of magic. That's what Milwaukee magician Great Scott can accomplish for you. The audience gets involved in the magic, making the show highly interactive. And that is what helps make Scott's shows so in demand. When looking for a magician, Great Scott really is the best choice. 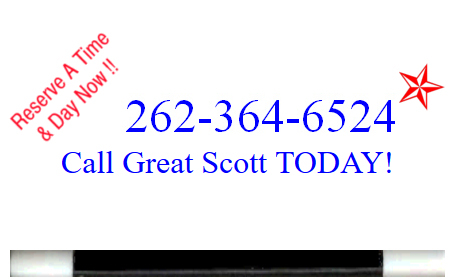 Call Scott and find out. When looking for a magician, you may feel that "all magic is alike" or "all magicians are alike". A good, professional magician will tell you that is not true. Several questions must be answered to determine what type of entertainment you need. Will this be for children only? Will this be entertainment for parties for adults? Perhaps it is an event with families in mind. Each of these will require a different approach to the show. A few other questions to answer are, "What type of event is it?" Is this a birthday party? Is this a business function or corporate event? Obviously these two examples also require different approaches. Even an adult birthday party is typically a more relaxed event than a company, awards ceremony -from an entertainment perspective. Both require fun and interaction, but the presentation will be subtly different. How many will be attending? Are you looking for a more intimate show or a full stage production? How much room is available? If your plans include a gathering with a cocktail period prior to a meeting, or even if this is for a large dinner party, you may want strolling magic. This is a great way to get people mixing and talking about a common experience. "Did you see what the magician did with my ring?" "How did that card end up in his wallet?" Plus, you'll see people laughing and having a great time as amazing magic happens right in their hands. Many situations will lend themselves to this type of entertainment. And a good performer will know how to adapt to each group of individuals to help them all relax, enjoy the performance and feel comfortable in the venue. If this is a larger crowd, or you are planning for after-dinner entertainment, then a stage show is appropriate. Actually, even in-home parties can use a 'stage show'. Though it is usually referred to as a parlor show (from the days when homes actually had parlors). Basically, the show needs to scale to the audience size. And your entertainer should understand how to do that to maximize the fun and entertainment value. If you are searching for magicians for birthday parties, then visit my birthday page listed under the "children's shows' link above. Birthdays for children are a unique and fun way to entertain kids. But the performer needs to be able to match the energy level of the audience. Sometimes the cake and soda kick in just as the show is about to start. Sometimes it's later in the day or after school. These can all work, but it takes an experienced performer to understand how to 'manage' that potentially rowdy group of six year olds. Not just everyone can. If you are looking for birthday party places, then consider a few options. First, a great performer will be able to keep the children's attention and focus for at least an hour to an hour and a half. So your home may work just fine. Guests come, show starts, balloon creations are made, pizza and cake are served. Play a game and the party is over. Not too stressful. However, if an out-of-home experience is desired think about places near you that have rooms available. Places like hotels have conference rooms. Libraries usually have an activity room that may be available. Then there are the bowling alleys, jump houses, and of course in the summer your local park with a covered or indoor pavilion can work. A magic show can fit into lots of venues. Just leave room for a 'stage' area and a place for the kids on the floor. Bring a blanket if you want the children to sit on it. That actually keeps everyone contained in a specific area and can help the momentum of the show as well. People are always searching for 'Kids birthday party ideas near me' or 'birthday party places Milwaukee'. Well, following the idea above you should be able to come up with some great options for places - and of course Great Scott is the magician that can fit the bill. Scott Obermann (aka. Great Scott) is a full-time entertainer. He is one of the magicians near Milwaukee and serving clients throughout Wisconsin, Illinois, Minnesota and Iowa. He presents magical entertainment for small in-home parties, large banquet halls, cub scout meetings, school assembly programs, corporate entertainment, fairs, weddings and other events. His magic career began at the age of 12 with a simple child's magic kit. His love of this performance art grew as he performed magic shows for children's birthday parties and civic organizations. Now, he still loves performing childrens shows near Milwaukee. But he also performs sophisticated magic for adults throughout the midwest. Though his shows range from silly to the amazing, his dedication to providing the best possible entertainment is down right serious. Great Scott provides exciting magical entertainment services for functions of all sizes. As a Wisconsin magician, this Milwaukee-area based magician is a versatile and accomplished entertainer with expertise at combining the perfect amount of silliness with incredible magic. Great Scott delivers unique and fun magic with lots of clean humor perfect for business luncheons, banquets, corporate events, and private parties. Guests enjoy strolling magic for an up-close experience that encourages mingling as well as a fun precursor to a stage show after dinner. Stage and parlor magic shows cater to larger groups of adults in a variety of settings and venues including birthday parties, large civic, and business functions. Clients can depend on Great Scott to provide lots of laughs and audience interaction. Kids of all ages can also enjoy the innovative entertainer at child care facilities, libraries, and gospel magic programs for churches. Cub Scout Blue and Gold banquet magic Invite Great Scott to entertain your Scouts and their familes. DJ Dan -- SoundBlessed.com -- DJ services for weddings, Bar/Bat Mitzvahs, private parties, or any celebration. Dance like you just don't care. The Lighthouse Farm Wedding receptions and other events hosted in the old-world charm of an authentic 1800's barn. Country weddings. Beautiful setting -- Fantastic hosts.